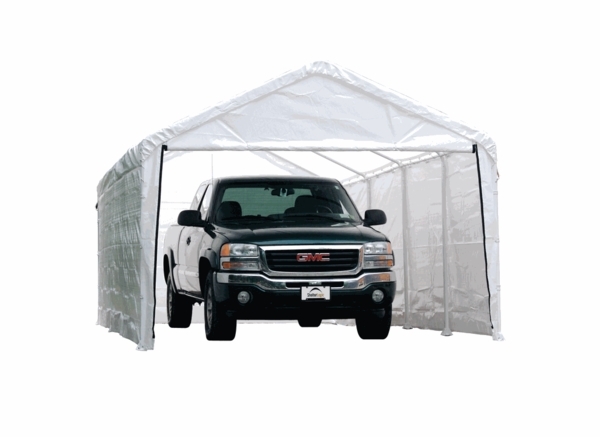 This Shelter Logic WHITE Enclosure Kit is designed for use with your existing 12 Foot by 26 Foot Canopy/Car Port. The Shelter Logic Enclosure Kit is WHITE. Kit includes two side walls, one solid rear panel, one front door panel with double-sided zipper and bungee cords. Each panel/wall easily attaches to your Shelter Logic Canopy measuring 12 Feet by 26 Feet. Enclosure Panels are triple layered durable polyethylene fabric that has been treated to block out threatening UV rays and to be waterproof. Product comes with a 1 Year Warranty and is sure to increase the functionality of your Shelter Logic Canopy, blocking out weather conditions for the protection (and/or pleasure) of whatever (or whomever) it may be covering. Shelter Logic -- It just makes sense.